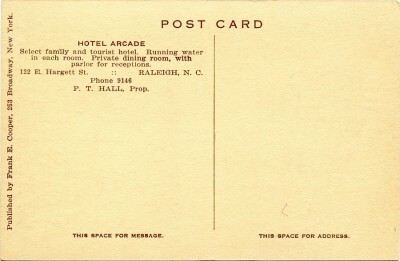 Hotel Arcade and Lobby, Raleigh, N.C. In recognition of Black History Month, we are publishing for Flashback Friday this week a rare postcard depicting Raleigh’s renowned Lightner Arcade. The hotel and amusement center once stood at the heart of the city’s 20th century African-American business district — E. Hargett St. Select family and tourist hotel. Running water in each room. Private dining room, with parlor for receptions. 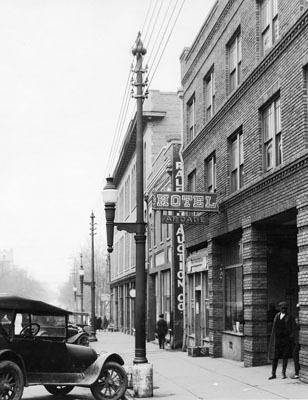 With stricter enforcement of Jim Crow laws in Raleigh in the early 1910s, E. Hargett St. soon emerged as the city’s business center of the African-American community — Raleigh’s ‘Black Main Street’ . Calvin E. Lightner*, prominent black Raleigh businessman, builder and funeral home owner, erected a three-story brick office building at 125 E. Hargett in 1915. 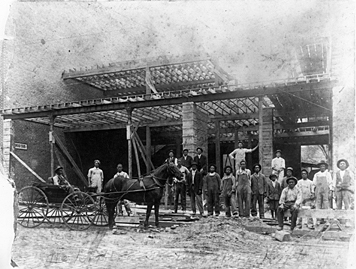 Lightner Office Building (125 E. Hargett St.) under construction ca 1915. Apparently Hargett St. was paved with Belgian block at this time. Six years later, in 1921, Calvin Lightner built his Lightner Arcade Hotel across the street at 122 E. Hargett. 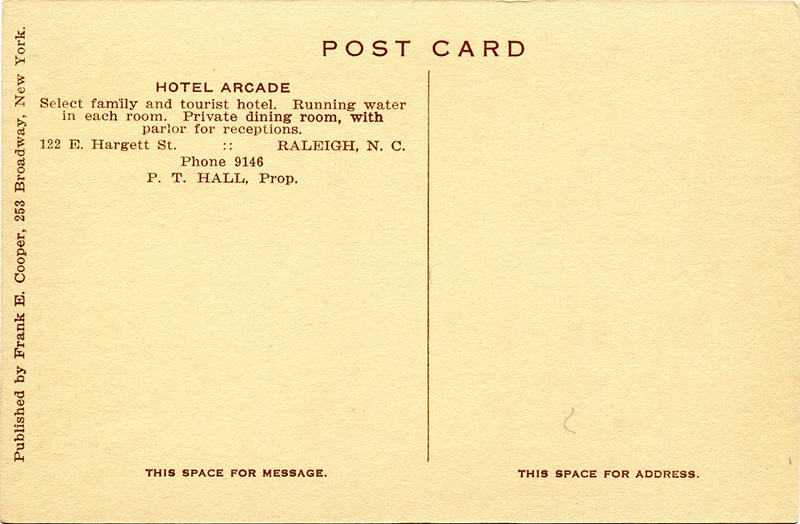 For several decades thereafter, the Arcade served as the only hotel in Raleigh which catered to African-American travelers. It featured a restaurant on the first floor and a ballroom on the third. A barbershop, drugstore and a newspaper (now known as The Carolinian), also occupied the first floor. Among those who stayed at the Arcade Hotel were Cab Calloway, Count Basie and Duke Ellington, who also performed in the upstairs ballroom. All the big bands would be at the Arcade. On Saturday you could not get through there. That is where everyone would come and congregate. They would be standing out on the street, socializing. Various social clubs, such as the Swan Club and Daughters of Ruth, also occupied the building over the years. For the decades of the 1920s-1940s the Lightner Arcade was the premier social hub of Raleigh’s African-American community. This is a view looking east on Hargett St. in 1926. The Lightner Arcade Hotel can be seen at the right, with the Montague Building (still standing) at the end of the block. 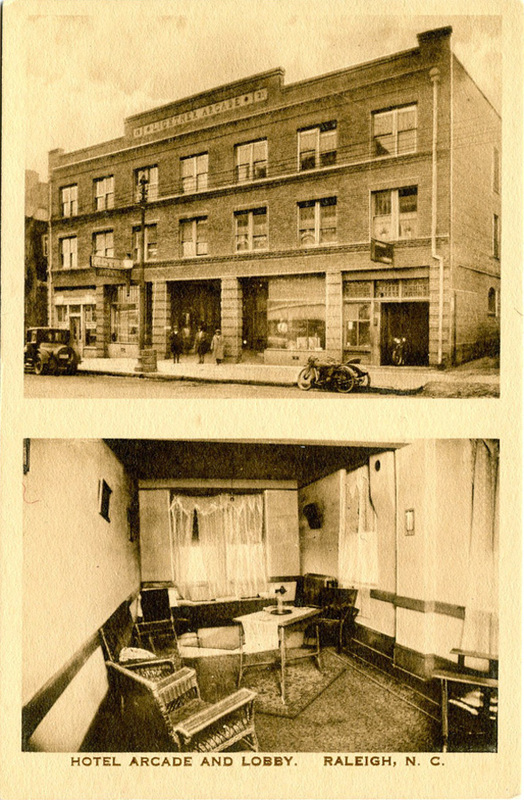 Lightner eventually lost ownership of the building, but the Arcade Hotel continued in business for many years thereafter. 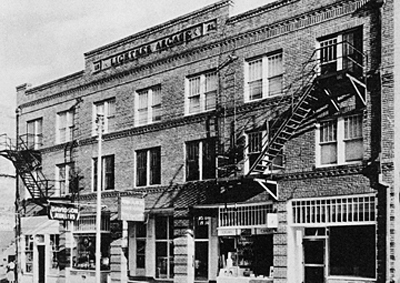 The NC Homemakers Association acquired the building in the late 1940s, and the name was changed to the Home Eckers Hotel. In the 1960s the Peebles Hotel occupied the building until it was destroyed by fire in 1970. The site of the Lightner Arcade is now occupied by the city’s central municipal bus depot. The Lightner Arcade, as it appeared while the Home Eckers Hotel, ca 1950. Archival photos courtesy North Carolina State Archives. *Biographical note: Calvin E. Lightner was a contemporary of Raleigh physician Dr. Manassa T. Pope. In 1919 Dr. Pope headed a non-partisan African-American slate of candidates along with Calvin Lightner. Pope ran for mayor and Lightner for commissioner. Given that blacks were essentially disenfranchised at the time, the outcome of the election was self-evident — they garnered few votes. Nonetheless, their participation in the election was a bold political statement by Raleigh’s black community. Calvin Lightner’s son, Clarence, was born in 1921, the year the Arcade was built. Clarence Lightner successfully ran for Raleigh City Council in 1967 and served six years. He was elected Raleigh’s first African-American mayor in 1973. The Lightner Funeral Home, founded in 1911 by Calvin Lightner, continues in operation today under the management of the Lightner family. “Flashback Friday” is a weekly feature of Goodnight, Raleigh! in which we showcase vintage postcards depicting our historic capital city. We hope you enjoy this week-end treat! Was the building on 122 or 125 E. Hargett? An odd-numbered address would put it on the north side of the street where Heilig-Levine/AA Odd Fellows/Raleigh Furniture are, not the south/bus station side, right? Ben — yeah, it can be a little confusing, but here goes: The Lightner Office Building, 125 E. Hargett, (built 1915, demolished mid-1960s) stood where the vacant lot is now between the Raleigh Furniture Co. building and the Remedy Diner (Delaney Building). You can see this in the 1950 volume of Sanborn Maps, sheet 15. Both were three-story brick buildings, though the Arcade had a much larger footprint. I have updated this post with a photo taken in 1926 which shows the Arcade Hotel in context, adjacent to the Montague Building (1912). It’s Raleigh’s loss that both these historic buildings, once landmarks on Hargett St., are now gone.